It's home to some of the most mind-blowing natural formations of Mother Nature! An idyllic pink lake, a “window” carved of stone and 3.5 metre-high pillars erupting from desert floors – sounds unreal? They are, in fact, very real and can be found in Western Australia – the home to some of the most mind-blowing natural formations of Mother Nature. 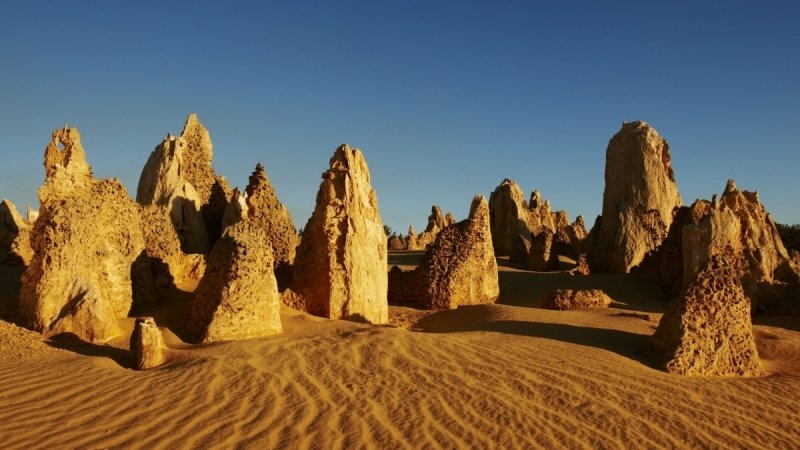 Head outside of the capital of Perth and discover the region’s amazing natural wonders with Dynasty Travel’s 8D6N Perth, Coral Coast + Pink Lake itinerary. Visit the most Instagrammable sights in Perth and its surrounds, with exclusive experiences that will make your trip all the more magical! 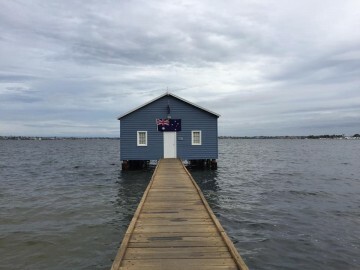 Read on to discover just how beautiful these natural delights in Perth are! About 4 hours away from Perth, the Leaning Trees of Greenough make for one unbelievably cool scene. These red river gum trees bend to impossible angles as a stunning result of weathering the southerly winds. 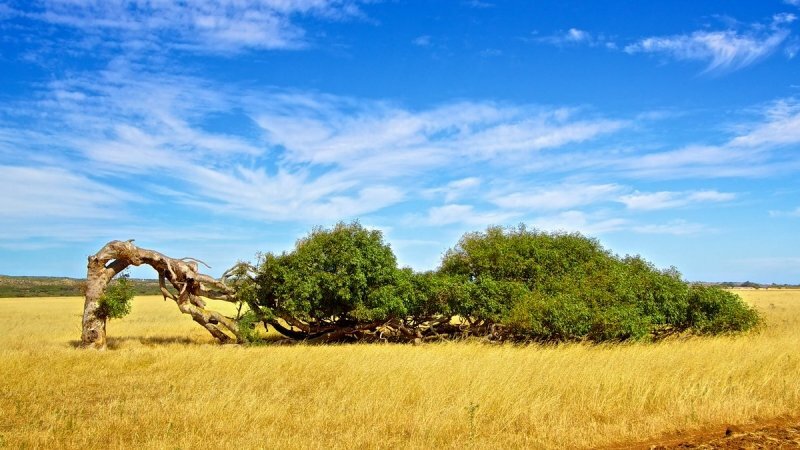 With their strong trunks contorted and branches scraping the ground against the backdrop of Greenough’s grasslands, these trees are truly a sight to behold. Itching to take a photo? This popular park is home to astoundingly crafted rock formations and gorges created from the flow of the Murchison River. 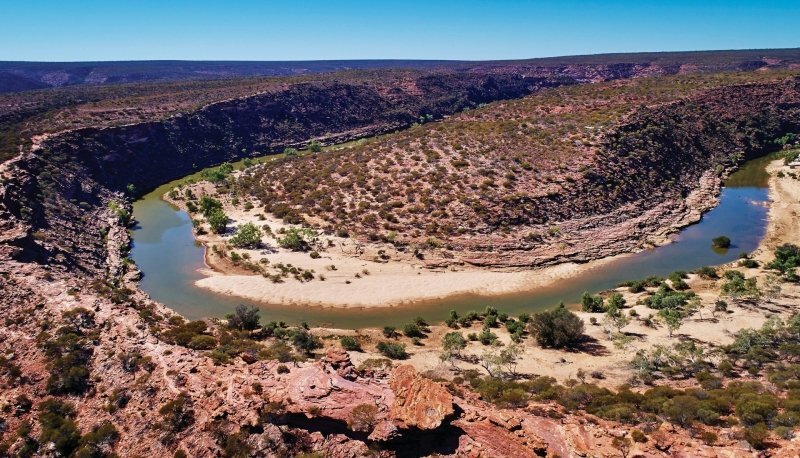 Explore the Kalbarri National Park for free and enjoy the wonderful sights and pit stops along the drive up north from Geraldton to Kalbarri. 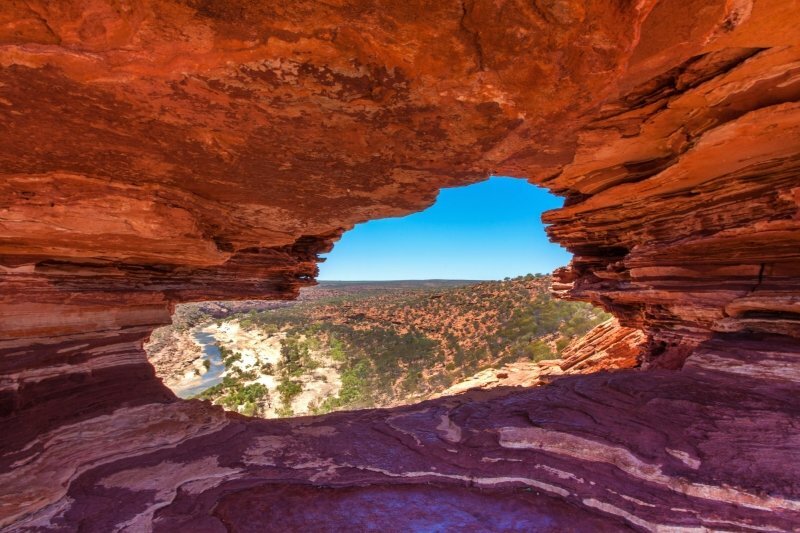 A favourite to visit in Kalbarri National Park is Nature’s Window, a Tumblagooda sandstone formation that takes the shape of a window, perfectly framing the river below. Don’t forget to take that perfect Instagram shot in the window itself! 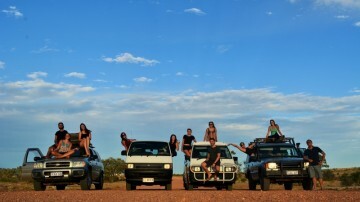 The Z-Bend Lookout offers the most magnificent views of the Murchison River Gorge. Gaze down the 150m vertical drop to view the river coursing below, lined with red river gum trees and flanked by striking Tumblagooda sandstone formations. Another lookout point from which you can enjoy spectacular panoramic views of the gorge is Eagle Gorge Lookout. As the name suggests, catch eagles coasting overhead or swooping in for a kill. 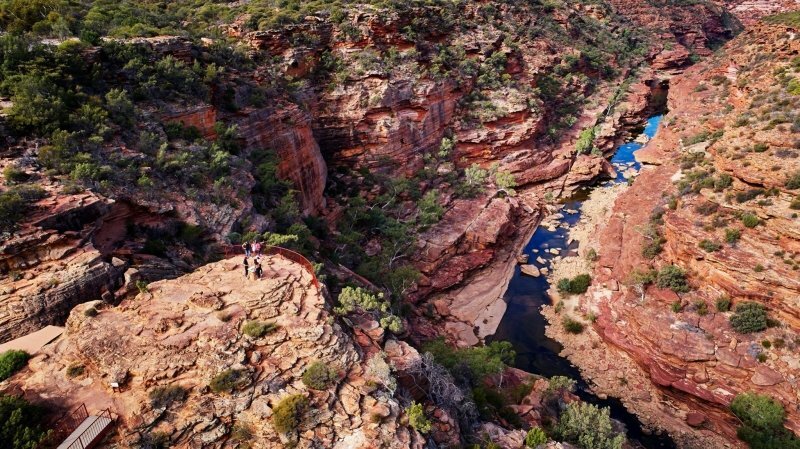 For the best views of Kalbarri National Park, head to the peak of Eagle Gorge Lookout and be in awe of the sheer expanse of one of the most popular and accessible parks in Australia. 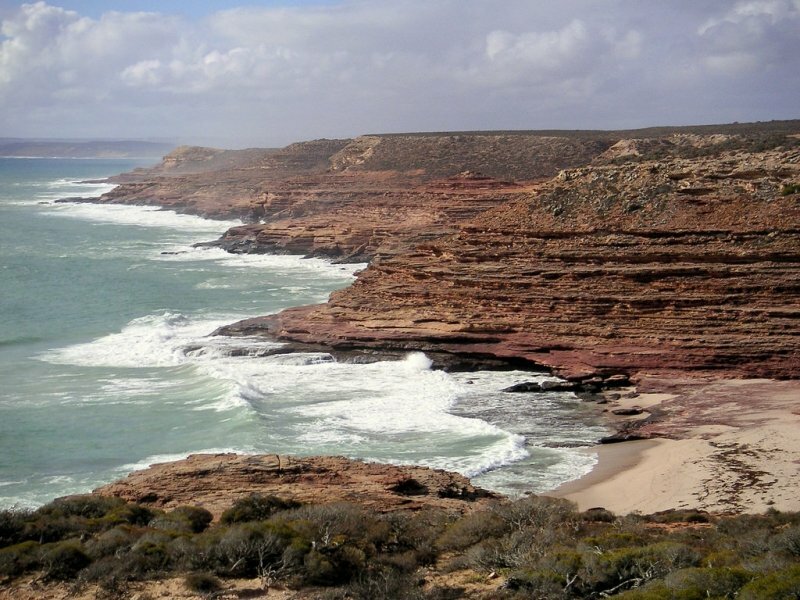 A product of the waves’ endless crashing against the rock walls, the Kalbarri Natural Bridge and Island Rock have been carved out from the main cliffs through erosion. Admire them from the perfect vantage point up on the cliffs and keep your eyes peeled as you stroll along the cliff’s edge – you might even spot a pod of dolphins and whales depending on the season! The highlight of this itinerary is a trip to Hutt Lagoon, home to one of the most fascinating natural wonders in the world – the Pink Lake. 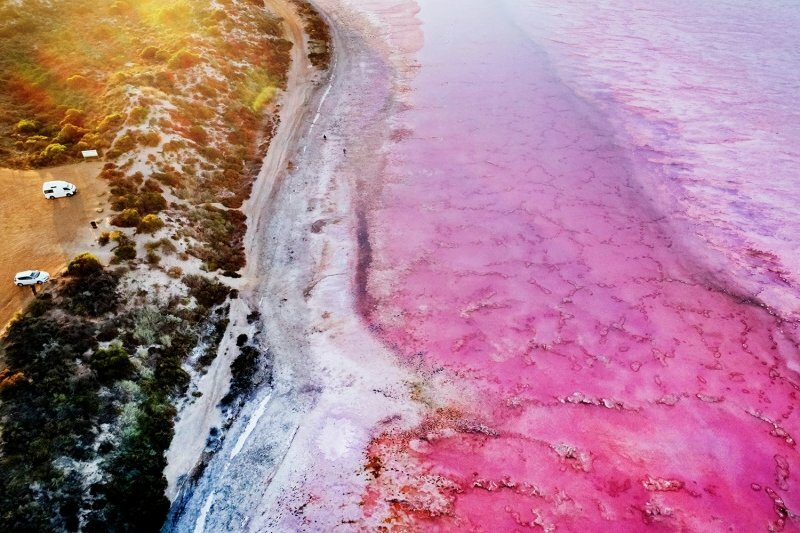 Due to the presence of carotenoid-producing algae Dunaliella salina, the lake boasts a unique pink hue and can cycle through shades of bubblegum pink, lilac and magenta depending on the time of day and season. 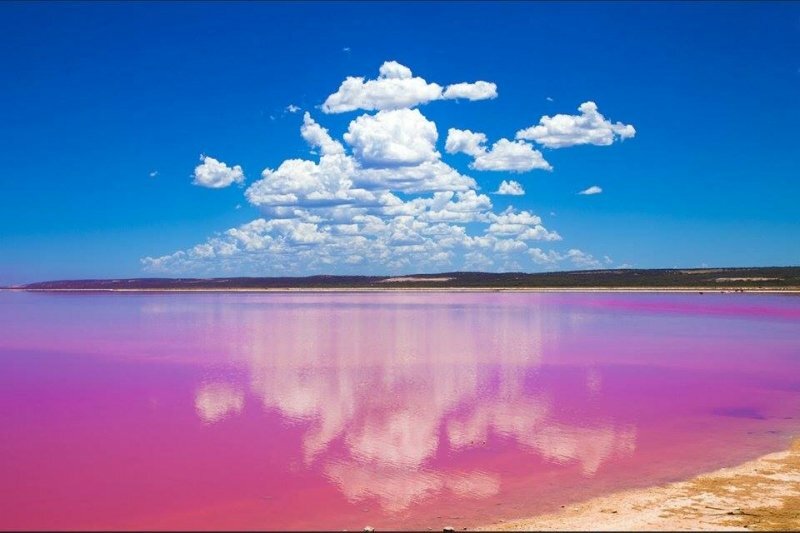 14 kilometres long and 2.3 kilometres wide, it stands as the largest pink lake in Australia. If viewing the Pink Lake from the shore isn’t enough, experience a once-in-a-lifetime opportunity to admire the lake from above. 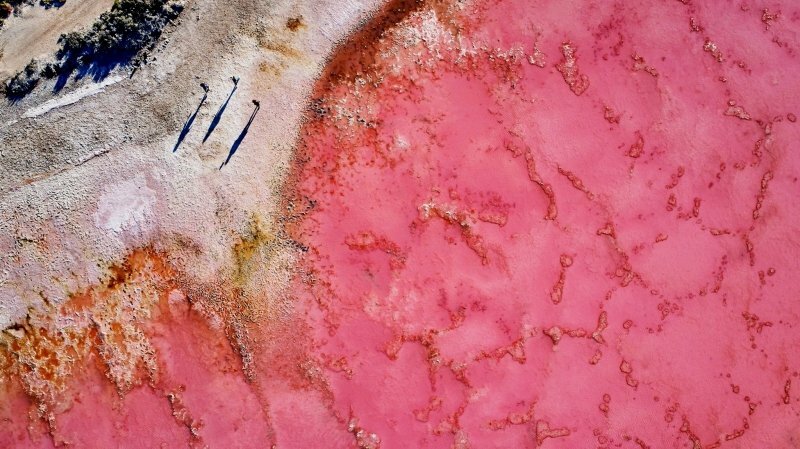 Hop on the Hutt Lagoon/Pink Lake Scenic Flight, which will take you along the coast for an aerial appreciation of the Pink Lake. Admire the stark contrast between the Pink Lake’s blushing shades and the bright blues of the Indian Ocean; you won’t be able to enjoy such awe-inspiring views of this incredible natural wonder anywhere else! 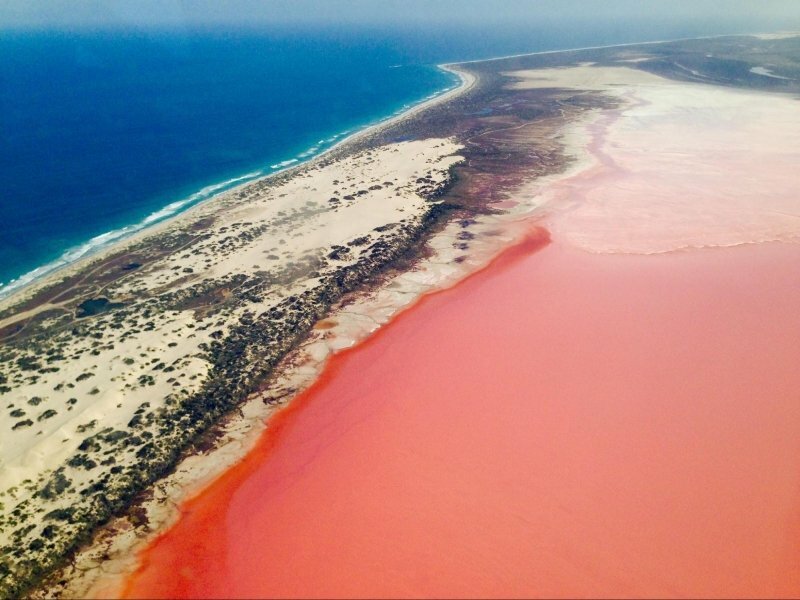 The Dynasty Travel 8D6N Perth, Coral Coast + Pink Lake Itinerary will take you on an exclusive and epic scenic flight across the Hutt Lagoon and Pink Lake! Be in awe of the wide expanse of the Pink Lake from your own private aircraft, way above in the air. It’s definitely an experience you’ll never forget! Book now to enjoy this breathtaking scenic flight and other exclusive experiences in Perth and its surrounds, only with Dynasty Travel. 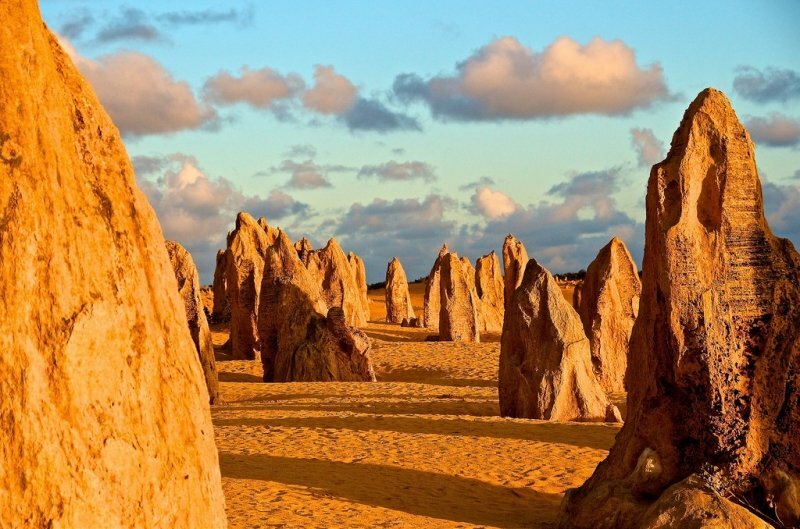 If you’re wondering how anything can top that, be prepared to be wowed by the marvellous Pinnacles Desert. In a sea of sand dunes, these imposing limestone structures stand like mysterious figures, all uniquely shaped and patterned in an artistic display by Mother Nature. The most magical time to see this popular attraction is at sunrise or sunset, when the shifting light of dawn and dusk creates a dazzling display of moving shadows. A two and half hour drive from Perth, arrive just in time for the Sunset Pinnacles Experience so you don’t miss out on this spellbinding moment! For a healthy dose of adventure, head two hours out of Perth to the Lancelin Sand Dunes. Climb to the top of the sand dunes and sandboard down the huge expanse of sand – now how’s that for an adrenaline rush? But before you go speeding down the slopes, don’t forget to admire the killer view of the coastline and surrounding farms while you’re up there. 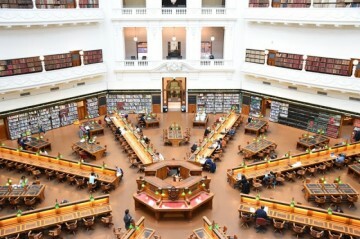 Not all of Western Australia’s natural wonders are inanimate! 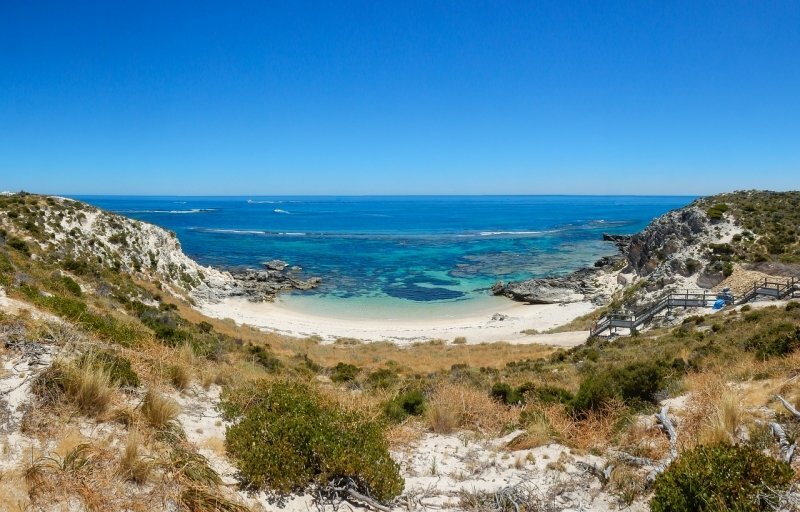 Best known for being home to the “World’s Happiest Animal”, also known as the quokka, Rottnest Island has a rich diversity of flora and fauna just waiting to be discovered. 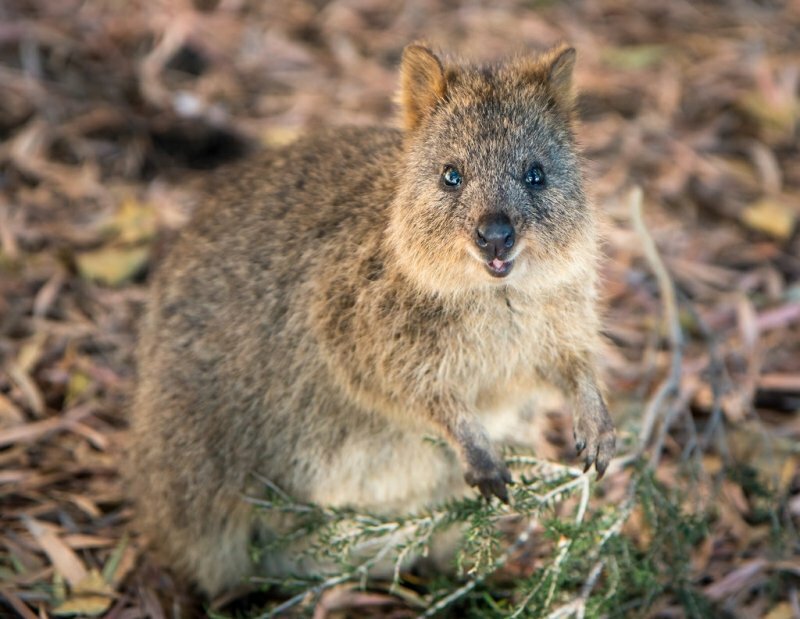 In fact, many tourists (and even celebrities) travel far and wide to Rottnest Island, just to take a coveted selfie with this adorable animal! Don’t leave the island without going on the “hunt” (not literally of course!) for an adorable quokka to take your own mandatory #quokkaselfie. 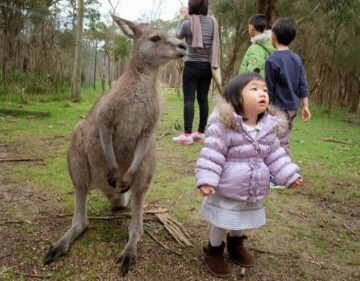 Just remember to respect the animals so that the world can continue to enjoy these jolly creatures! 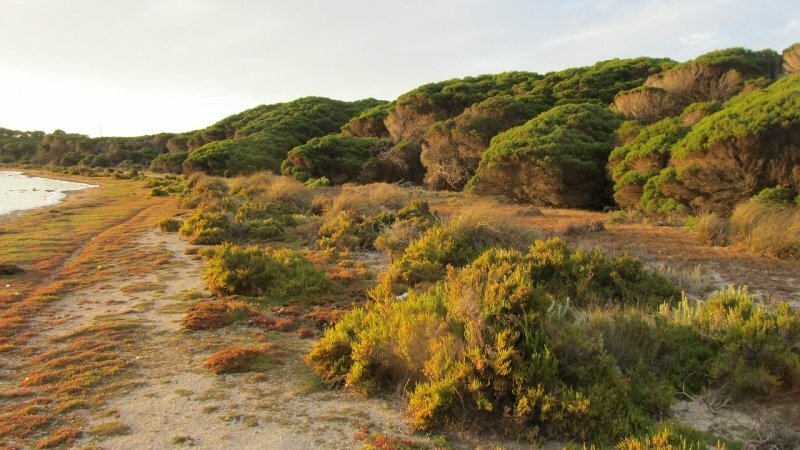 Join the Discover Rottnest Island Tour that will take you on a comprehensive, guided tour around the island. Not only do you get to see all the most exciting parts of the island, the tour is complete with insightful commentary from local guides. Explore the cultural and historical aspects of the island as you appreciate the robust wildlife and verdant greenery. You’ll even have time to stroll around the village centre! 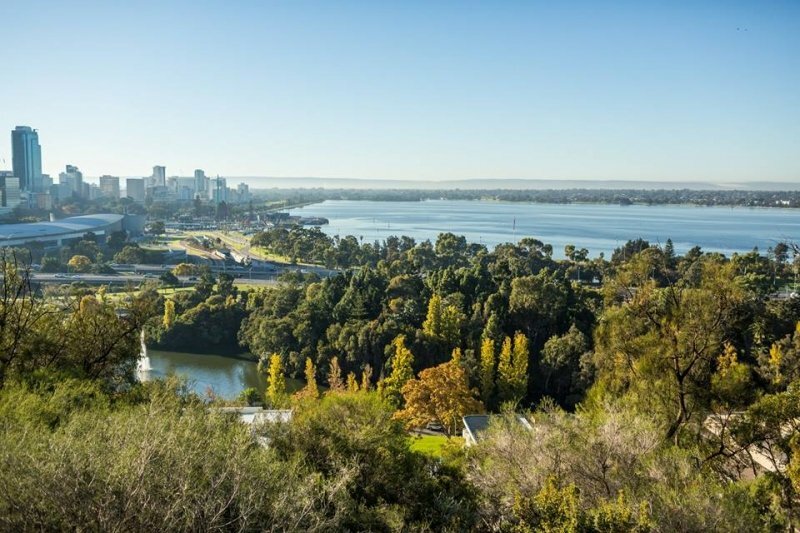 A gem in the centre of Perth’s bustling city, Kings Park boasts splendid vantage points of the city as well as the lovely Swan River. There, you can find an abundance of native botany and lush flora as you soak in the spectacular views. 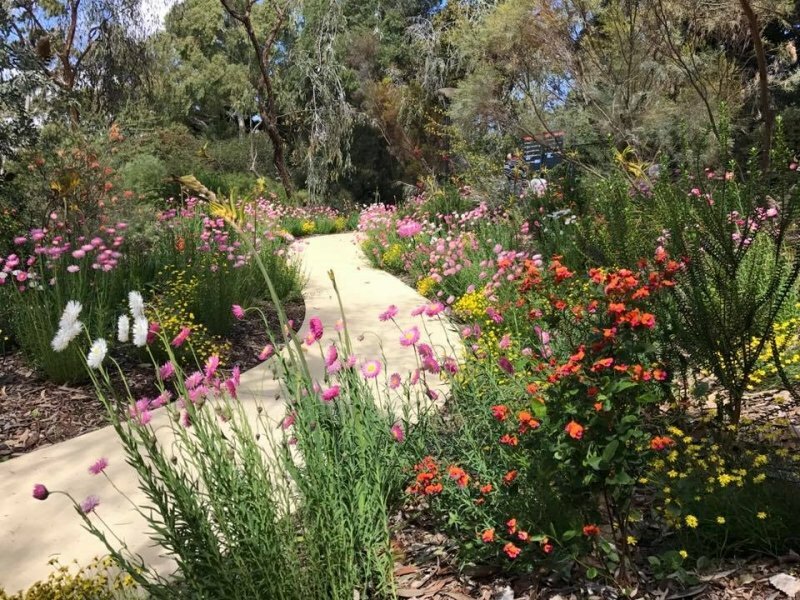 Tucked away in the heart of the city, this is a brilliant stretch of scenic nature that is a must-visit in Perth. If you’re bowled over by the unbelievable plethora of natural wonders that Perth and its surrounds have to offer, wait until you see them in person! With Dynasty Travel’s 8D6N Perth, Coral Coast + Pink Lake itinerary, you get to explore these majestic attractions with exclusive experiences that will help you to make the most out of your trip to Perth. 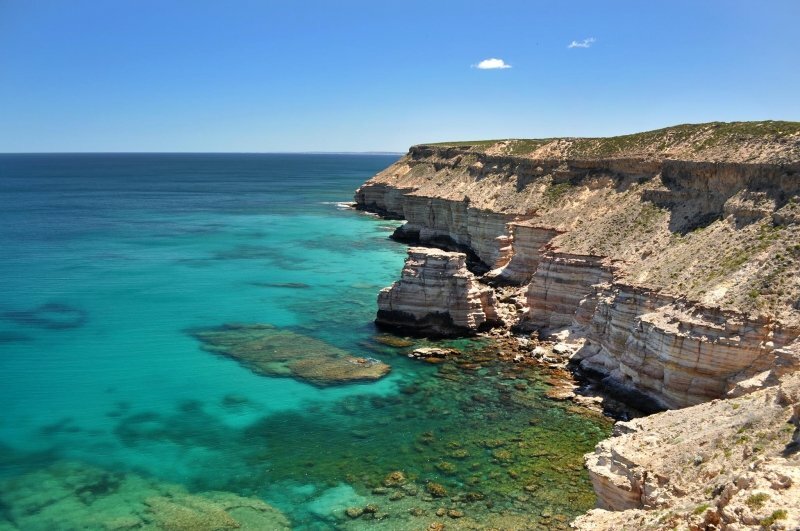 Book here for a hassle-free travelling experience that enables you to discover the true natural beauty of Western Australia. Brought to you by Dynasty Travel (‘Travel Agencies — Best for Australia’ at TripZilla Excellence Awards 2018).